One obvious question about Halloween is, "What does the word itself mean?" The name is actually a shortened version of "All Hallows' Even," the eve of All Hallows' Day. "Hallow" is an Old English word for "holy person," and All Hallows' Day is simply another name for All Saints' Day, the day Catholics commemorate all the saints. At some point, people began referring to All Hallows' Even as "Hallowe'en" and then simply "Halloween." Many have never considered decorating their homes for Halloween. On this controversial Holiday why not bring some joy and fun to your neighborhood this Halloween. Halloween doesn't have to be full of scary wickedness surrounded by witches and demons. Make your yard a joy for the trick or treaters to walk up to, with some lighted Pumpkins or maybe a Animated Waving Scarecrow. 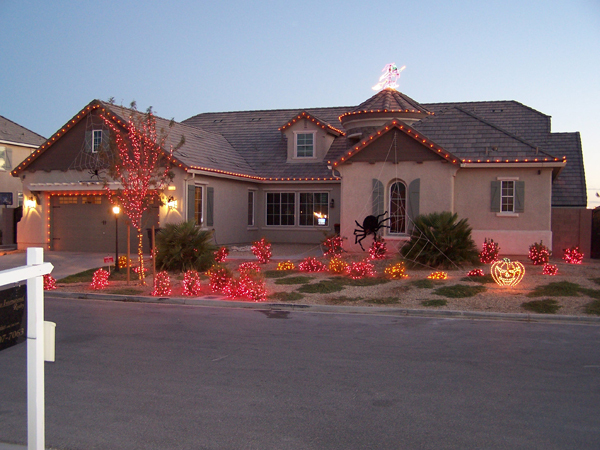 Share some goodness this Halloween with outdoor Halloween lights. Consider lining your driveway with Pumpkin Lawn Stakes!